Foundation Fun!!! – Shanna C.
Recently, I have been trying out a new foundation. I wanted to do a thorough review on it, so I have been wearing it for about four months. I wanted to make sure I fully experienced the product before sharing my opinion on it. 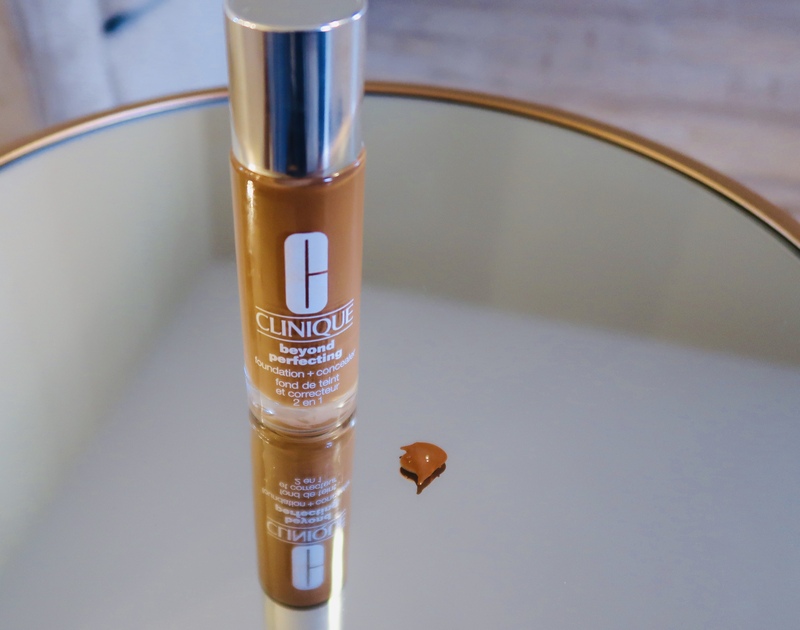 For the past four months I have been wearing Clinique’s Beyond Perfecting liquid foundation in the color Amber. The very first thing I notice about the foundation was the applicator. The applicator is a wand, this allows for control. It gives you control of how much product you want to use and where you want to put it. The applicator wand is soft and gentle to the touch. I actually love the way it feels against my skin. This foundation claims to be beyond perfecting, meaning it doubles as a foundation and a concealer. Supposedly giving you more bang for your buck. I guess the thought behind this product, was to eliminate a step in your make up routine. For the life of me I could not stop using my concealer in conjunction with the foundation. Having used concealer all of my make up life, it almost seemed like a sin not to use it. So, I can’t comment on how well it does by itself without the added concealer. With this product I notice there were numerous shades for me to choose from. I was able to pick my shade right away on the first choice. I think it has to do with the container. The container is clear and you can easily observe the shades. I enjoyed the fact that I could see through the bottle. It made my choice of color easy. 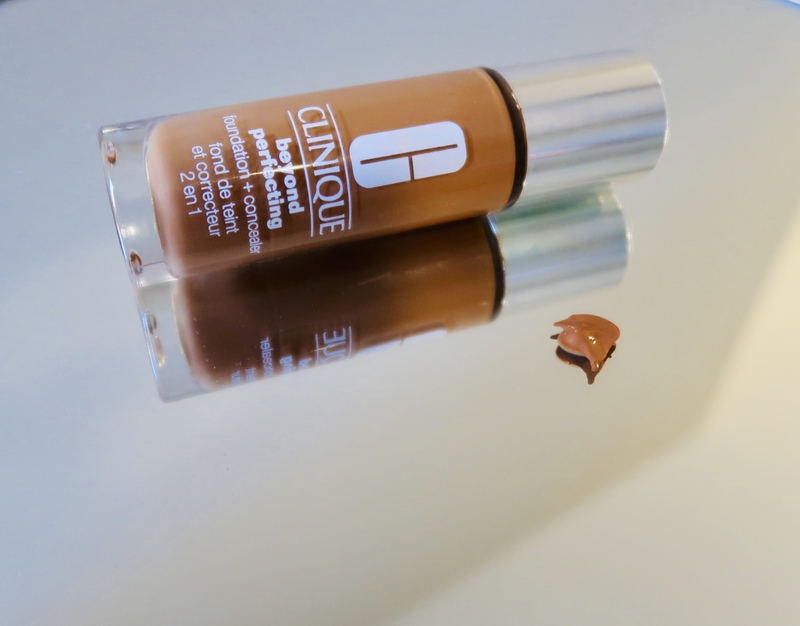 Clinique’s Beyond Perfecting liquid foundation is easy to apply and it is buildable. It allows you to build and build without the cakey look or feel. It will smooth out your complexion with little to no effort. Because the foundation is lightweight, a little bit of this foundation will go a long way. Throughout the day the foundation does last and stays true to tone on my skin. So, there is no need to re-apply. The only thing I did not like about this foundation was the fact that it creased in my laugh lines and in the lines under my eyes. No matter how much or how little I put on my face those areas always crease. I believe it is do the fact that this foundation doesn’t have a matte finish. 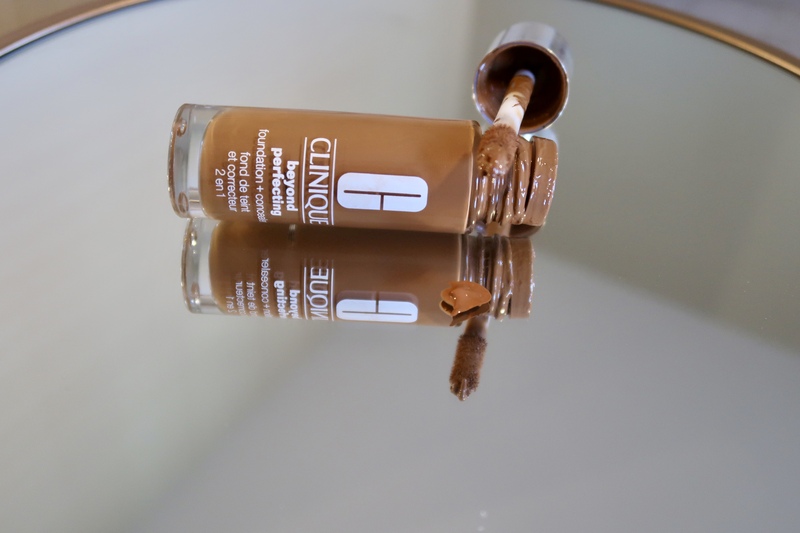 This foundation leaves you with a dewy finish, which has not been my style. I’m a matte girl myself, but I wanted to try something different. Because this foundation does not provide a matte finish, it’s constantly formulating to make your skin look supple and dewy. I think that is the reason for the creases around my eyes and in my laugh lines. If you are looking for something reasonably priced, this foundation is the way to go. It’s price point is a mere Twenty-nine dollars. This is a steal in comparison to other liquid foundations. So you do get most for your dollars in that regard. If for some reason you find yourself in the same boat as I am and want to try something other than Clinique’s Beyond Perfecting liquid foundation, Clinique has many options. Clinique offers a variety of foundations for oily, dry, and combination skin. They offer everything from a dewy to matte finish. Their foundations also come in different formulas. They have liquid, stick, powder, and pressed powder. I would recommend looking at the Clinique website and taking the makeup quiz. This will help you narrow down your search for the perfect foundation fit for you. What foundations have you tried? Which is your favorite?